^ Tad M. Schmaltz, Radical Cartesianism: The French Reception of Descartes, Cambridge University Press, 2002, p. 257. ^ Stephen Gaukroger, Descartes: An Intellectual Biography, Clarendon Press, 1995, p. 228. ^ a b Étienne Gilson argued in La Liberté chez Descartes et la Théologie (Alcan, 1913, pp. 132–147) that Duns Scotus was not the source of Descartes' Voluntarism. 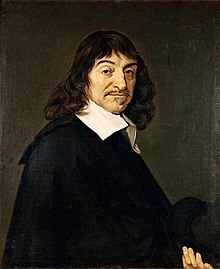 Although there exist doctrinal differences between Descartes and Scotus "it is still possible to view Descartes as borrowing from a Scotist Voluntarist tradition" (see: John Schuster, Descartes-Agonistes: Physico-mathematics, Method & Corpuscular-Mechanism 1618–33, Springer, 2012, p. 363 n. 26). ^ Alexander Afriat, "Cartesian and Lagrangian Momentum" (2004). ^ Marenbon, John (2007). Medieval Philosophy: an historical and philosophical introduction. Routledge. p. 174. ISBN 978-0-415-28113-3. ^ H. Ben-Yami, Descartes' Philosophical Revolution: A Reassessment, Palgrave Macmillan, 2015, p. 76. ^ H. Ben-Yami, Descartes' Philosophical Revolution: A Reassessment, Palgrave Macmillan, 2015, p. 179: "[Descartes'] work in mathematics was apparently influenced by Vieta's, despite his denial of any acquaintance with the latter’s work." ^ "She thinks, therefore I am". Columbia Magazine. Fall 2017. Retrieved 2017-09-17. ^ "Descartes". Collins English Dictionary. HarperCollins. ^ "Descartes, René" (US) and "Descartes, René". Oxford Dictionaries. Oxford University Press. Retrieved March 12, 2019. ^ Colie, Rosalie L. (1957). Light and Enlightenment. Cambridge University Press. p. 58. ^ This idea had already been proposed by the Spanish philosopher Gómez Pereira a hundred years ago in the form: "I know that I know something, anyone who knows exists, then I exist" (nosco me aliquid noscere, & quidquid noscit, est, ergo ego sum). See: Gómez Pereira, Antoniana Margarita: "De Immortalitate Animae", 1749 , p. 277; Santos López, Modesto (1986). "Gómez Pereira, médico y filósofo medinense". In: Historia de Medina del Campo y su Tierra, volumen I: Nacimiento y expansión, ed. by Eufemio Lorenzo Sanz, 1986. ^ Carlson, Neil R. (2001). Physiology of Behavior. Needham Heights, Massachusetts: Pearson: Allyn & Bacon. p. 8. ISBN 0-205-30840-6. ^ Grondin, J., Introduction to Metaphysics: From Parmenides to Levinas (New York: Columbia University Press, 2004), p. 126. ^ a b Bruno, Leonard C. (2003) . Math and Mathematicians: The History of Math Discoveries Around the World. Baker, Lawrence W. Detroit, Mich.: U X L. p. 99. ISBN 0-7876-3813-7. OCLC 41497065. ^ Rodis-Lewis, Geneviève (1992). "Descartes' Life and the Development of His Philosophy". In Cottingham, John. The Cambridge Companion to Descartes. Cambridge University Press. p. 22. ISBN 978-0-521-36696-0. ^ a b c d e f Bruno, Leonard C. (2003) . Math and Mathematicians: The History of Math Discoveries Around the World. Baker, Lawrence W. Detroit, Mich.: U X L. p. 100. ISBN 0-7876-3813-7. OCLC 41497065. ^ Porter, Roy (1999) . "The New Science". The Greatest Benefit to Mankind: A Medical History of Humanity from Antiquity to the Present (paperback edition, 135798642 ed.). Great Britain: Harper Collins. p. 217. ISBN 0-00-637454-9. ^ Baird, Forrest E.; Kaufmann, Walter (2008). From Plato to Derrida. Upper Saddle River, New Jersey: Pearson Prentice Hall. pp. 373–377. ISBN 0-13-158591-6. ^ a b c Guy Durandin (1970. Les Principes de la Philosophie. Introduction et notes. Librairie Philosophique. Paris: J. Vrin. ^ a b Bruno, Leonard C. (2003) . Math and mathematicians : the history of math discoveries around the world. Baker, Lawrence W. Detroit, Mich.: U X L. p. 101. ISBN 0-7876-3813-7. OCLC 41497065. ^ Otaiku AI (2018). "Did René Descartes have Exploding Head Syndrome?". J Clin Sleep Med. 14 (4): 675–8. doi:10.5664/jcsm.7068. PMC 5886445. PMID 29609724. ^ Durant, Will; Durant, Ariel (1961). The Story of Civilization: Part VII, the Age of Reason Begins. New York: Simon and Schuster. p. 637. ISBN 0-671-01320-3. ^ Clarke (2006), pp. 58–59. ^ Shea, William R., The Magic of Numbers and Motion, Science History Publications, 1991, p. 94; Gaukroger, S. Descartes an intellectual biography, p. 132. ^ Nicolas de Villiers, Sieur de Chandoux, Lettres sur l'or potable suivies du traité De la connaissance des vrais principes de la nature et des mélanges et de fragments d'un Commentaire sur l'Amphithéâtre de la Sapience éternelle de Khunrath, Textes édités et présentés par Sylvain Matton avec des études de Xavier Kieft et de Simone Mazauric. Préface de Vincent Carraud, Paris, 2013. ^ Durant, Will and Ariel (1961). The Story of Civilization: Par VII, the Age of reason Begins. New York: Simon and Schuster. p. 638. ISBN 0-671-01320-3. ^ Porterfield, J., René Descartes (New York: Rosen Publishing, 2018), p. 66. ^ While in the Netherlands he changed his address frequently, living among other places in Dordrecht (1628), Franeker (1629), Amsterdam (1629–1630), Leiden (1630), Amsterdam (1630–1632), Deventer (1632–1634), Amsterdam (1634–1635), Utrecht (1635–1636), Leiden (1636), Egmond (1636–1638), Santpoort (1638–1640), Leiden (1640–1641), Endegeest (a castle near Oegstgeest) (1641–1643), and finally for an extended time in Egmond-Binnen (1643–1649). ^ He had lived with Henricus Reneri in Deventer and Amsterdam, and had met with Constantijn Huygens and Vopiscus Fortunatus Plempius; Descartes was interviewed by Frans Burman at Egmond-Binnen in 1648. Henricus Regius, Jan Stampioen, Frans van Schooten, Comenius and Gisbertus Voetius were his main opponents. ^ a b c Bruno, Leonard C. (2003) . Math and mathematicians: the history of math discoveries around the world. Baker, Lawrence W. Detroit, Mich.: U X L. p. 103. ISBN 0-7876-3813-7. OCLC 41497065. ^ a b "Pierre de Fermat | Biography & Facts". Encyclopedia Britannica. Retrieved 2017-11-14. ^ a b Descartes, René. (2009). Encyclopædia Britannica. Encyclopædia Britannica 2009 Deluxe Edition. Chicago: Encyclopædia Britannica. ^ a b Smith, Kurt (Fall 2010). "Descartes' Life and Works". The Stanford Encyclopedia of Philosophy. ^ Bruno, Leonard C. (2003) . Math and mathematicians : the history of math discoveries around the world. Baker, Lawrence W. Detroit, Mich.: U X L. pp. 103–4. ISBN 0-7876-3813-7. OCLC 41497065. ^ Bruno, Leonard C. (2003) . Math and mathematicians: the history of math discoveries around the world. Baker, Lawrence W. Detroit, Mich.: U X L. p. 104. ISBN 0-7876-3813-7. OCLC 41497065. ^ "Descartes was "poisoned by Catholic priest" – The Guardian, Feb 14 2010". The Guardian. Retrieved 8 October 2014. 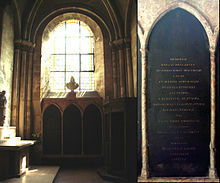 ^ The remains are, two centuries later, still resting between two other graves–those of the scholarly monks Jean Mabillon and Bernard de Montfaucon—in a chapel of the abbey. ^ "5 historical figures whose heads have been stolen". Strange Remains. 2015-07-23. Retrieved 2016-11-29. ^ "Ten books: Chosen by Raj Persuade". The British Journal of Psychiatry. ^ Descartes, René (1644). The Principles of Philosophy (IX). ^ a b Newman, Lex (2016). Zalta, Edward N., ed. The Stanford Encyclopedia of Philosophy (Winter 2016 ed.). Metaphysics Research Lab, Stanford University. ^ a b c d Descartes, René. "Letter of the Author to the French Translator of the Principles of Philosophy serving for a preface". Translated by Veitch, John. Retrieved 6 December 2011. ^ Cottingham, John. "'A Brute to the Brutes? ': Descartes' Treatment of Animals" (PDF). Whitman People. Retrieved 24 February 2018. ^ Watson, Richard A. (January 1982). "What Moves the Mind: An Excursion in Cartesian Dualism". American Philosophical Quarterly. University of Illinois Press. 19 (1): 73–81. JSTOR 20013943. ^ David Cunning (2014). The Cambridge Companion to Descartes’ Meditations. Cambridge University Press. p. 277. ISBN 978-1-107-72914-8. ^ a b David Cunning (2014). The Cambridge Companion to Descartes’ Meditations. Cambridge University Press. p. 278. ISBN 978-1-107-72914-8. ^ David Cunning (2014). The Cambridge Companion to Descartes’ Meditations. Cambridge University Press. p. 279. ISBN 978-1-107-72914-8. ^ David Cunning (2014). The Cambridge Companion to Descartes’ Meditations. Cambridge University Press. p. 280. ISBN 978-1-107-72914-8. ^ Georges Dicker (2013). Descartes: An Analytic and Historical Introduction. OUP. p. 86. ISBN 978-0-19-538032-3. ^ Georges Dicker (2013). Descartes: An Analytic and Historical Introduction. OUP. p. 87. ISBN 978-0-19-538032-3. ^ Georges Dicker (2013). Descartes: An Analytic and Historical Introduction. OUP. p. 301. ISBN 978-0-19-538032-3. ^ a b c Georges Dicker (2013). Descartes: An Analytic and Historical Introduction. OUP. p. 303. ISBN 978-0-19-538032-3. ^ Stanford Encyclopaedia of Philosophy (online): Descartes and the Pineal Gland. ^ a b Eric Shiraev (2010). A History of Psychology: A Global Perspective: A Global Perspective. Sage. p. 88. ISBN 978-1-4129-7383-0. ^ Baldwin, Bird T. (April 1913). "John Locke's Contributions to Education". The Sewanee Review. The Johns Hopkins University Press. 21 (2): 177–187. JSTOR 27532614. ^ Eric Shiraev (2010). A History of Psychology: A Global Perspective: A Global Perspective. Sage. p. 86. ISBN 978-1-4129-7383-0. ^ a b Eric Shiraev (2010). A History of Psychology: A Global Perspective: A Global Perspective. Sage. p. 87. ISBN 978-1-4129-7383-0. ^ Eric Shiraev (2010). A History of Psychology: A Global Perspective. Sage. p. 88. ISBN 978-1-4129-7383-0. ^ Jacob, Margaret C. (2009). The Scientific Revolution A Brief History with Documents. Boston: Bedford/St. Martin's. pp. 16, 17. ISBN 0-312-65349-2. 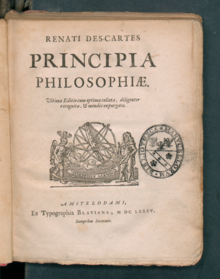 ^ "Descartes, Rene | Internet Encyclopaedia of Philosophy". www.iep.utm.edu. Retrieved 2017-02-22. ^ Grosholz, Emily (1991). Cartesian method and the problem of reduction. Oxford University Press. ISBN 0-19-824250-6. But contemporary debate has tended to...understand [Cartesian method] merely as the 'method of doubt'...I want to define Descartes' method in broader terms...to trace its impact on the domains of mathematics and physics as well as metaphysics. ^ Copenhaver, Rebecca. "Forms of skepticism". Archived from the original on 8 January 2005. Retrieved 15 August 2007. ^ "Animal Consciousness, No. 2. Historical background". Stanford Encyclopaedia of Philosophy. 23 December 1995. Retrieved 16 December 2014. ^ Lance Workman (2013). Charles Darwin: The Shaping of Evolutionary Thinking. Palgrave Macmillan. p. 177. ISBN 978-1-137-31323-2. ^ Tom Sorell, Descartes: A Very Short Introduction (2000). New York: Oxford University Press. p. 19. ^ Gullberg, Jan (1997). Mathematics From The Birth of Numbers. W.W. Norton. ISBN 0-393-04002-X. ^ Slowik, Edward (22 August 2017). Edward N. Zalta, ed. 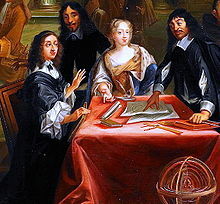 "Descartes' Physics". The Stanford Encyclopedia of Philosophy Archive. Retrieved 1 October 2018. ^ Tipler, P.A. and G. Mosca (2004). Physics For Scientists And Engineers. W.H. Freeman. ISBN 0-7167-4389-2. ^ "René Descartes". Encarta. Microsoft. 2008. Archived from the original on 7 September 2007. Retrieved 15 August 2007. ^ Contemporary Newtonian Research, edited by Z. Bechler, pp. 109–129, Newton the Mathematician, by Daniel T. Whiteside, Springer, 1982. ^ Cottingham, John; Murdoch, Dugald; Stoothof, Robert (1984). "Comments on a Certain Broadsheet". The Philosophical Writings of Descartes. Cambridge University Press. p. 293. ISBN 978-0-521-28807-1. ^ Vlasblom, Dirk (25 February 2010). "Unknown letter from Descartes found". NRC.nl (in Dutch). Archived from the original on 8 November 2016. Retrieved 30 May 2012. ^ Vlasblom, Drik. "Hoe Descartes in 1641 op andere gedachten kwam". NRC.nl (in Dutch). Archived from the original on 27 October 2016. René Descartes. Opere 1637–1649, Milano, Bompiani, 2009, pp. 2531. Edizione integrale (di prime edizioni) e traduzione italiana a fronte, a cura di G. Belgioioso con la collaborazione di I. Agostini, M. Marrone, M. Savini ISBN 978-88-452-6332-3. René Descartes. Opere 1650–2009, Milano, Bompiani, 2009, pp. 1723. Edizione integrale delle opere postume e traduzione italiana a fronte, a cura di G. Belgioioso con la collaborazione di I. Agostini, M. Marrone, M. Savini ISBN 978-88-452-6333-0. René Descartes. Tutte le lettere 1619–1650, Milano, Bompiani, 2009 IIa ed., pp. 3104. Nuova edizione integrale dell'epistolario cartesiano con traduzione italiana a fronte, a cura di G. Belgioioso con la collaborazione di I. Agostini, M. Marrone, F.A. Meschini, M. Savini e J.-R. Armogathe ISBN 978-88-452-3422-4. René Descartes, Isaac Beeckman, Marin Mersenne. Lettere 1619–1648, Milano, Bompiani, 2015 pp. 1696. Edizione integrale con traduzione italiana a fronte, a cura di Giulia Beglioioso e Jean Robert-Armogathe ISBN 978-88-452-8071-9. 1633. The World, or Treatise on Light, tr. by Michael S. Mahoney. 1633. Treatise of Man, tr. by T. S. Hall. Cambridge, MA: Harvard University Press, 1972. Agostini, Siegrid; Leblanc, Hélène, eds. (2015). Examina Philosophica. I Quaderni di Alvearium (PDF). Le fondement de la science. 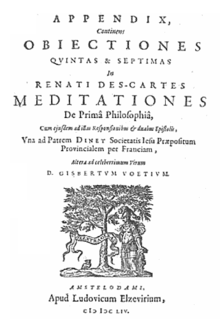 Les dix premières années de la philosophie cartésienne (1619–1628). Duncan, Steven M. (2008). The Proof of the External World: Cartesian Theism and the Possibility of Knowledge. Cambridge: James Clarke & Co. ISBN 978-0-227-17267-4. Archived from the original on 23 December 2008. Sasaki Chikara (2003). Descartes’s Mathematical Thought. (Boston Studies in the Philosophy of Science, 237.) xiv + 496 pp., bibl., indexes. Dordrecht/Boston/London: Kluwer Academic Publishers. Watson, Richard A. (2012). "René Descartes". Encyclopædia Britannica. Encyclopædia Britannica Online. Encyclopædia Britannica Inc. Retrieved 31 March 2012. Herbermann, Charles, ed. (1913). 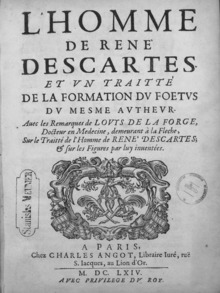 "René Descartes" . Catholic Encyclopedia. New York: Robert Appleton Company.